Old Factory House is a detached cottage in the townland of Ballinahown, within driving distance of Carraroe and Spiddal, just twenty miles from Galway. The cottage sleeps five people and has two double bedrooms and one single, along with a bathroom. Also in the cottage are a fitted kitchen and a sitting room with dining area and open fire. Outside is ample off road parking and a front and rear lawned gardens. Situated in the heart of Connemara, Old Factory House is a lovely family holiday cottage all year round. The small village of Rossaveel has a shop, pub, a restaurant open during the summer, a school and church, along with a port with regular sailing to the Aran Islands. There's plenty of attractions in the area, including Spiddal village, Connemara National Park, Kylemore Abbey and Galway Bay. Oil central heating with open fire. 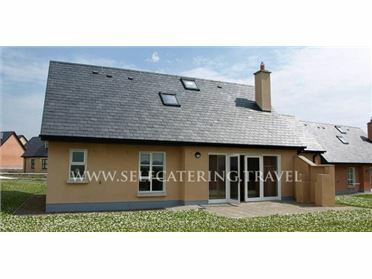 Electric oven and hob, microwave, fridge, washer/dryer, dishwasher, TV with Saorview, selection of books and games. Fuel, power and starter pack for fire inc. in rent. Bed linen and towels inc. in rent. Ample off road parking. Front and rear lawned gardens with furniture. Sorry, no pets and no smoking. Shop 1 mile, traditional thatched pub 5 mins walk. Note: There is one step into the bathroom, so property may not be suitable for people with mobility issues..